Ultimate Adventure Tour: Get Off The Beaten Tracks! This tour is a perfect fit for the people who wants to get off Palawan’s tourists trail. The Ultimate Adventure Tour is a tour designed for the people who want to get off the beaten tracks. 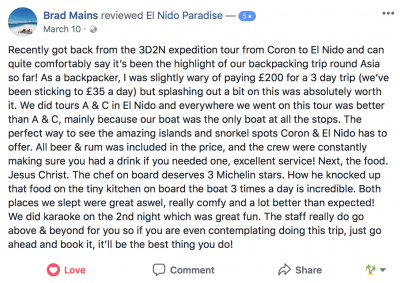 You can do this tour either from El Nido to Coron or from Coron to El Nido. The Ultimate Adventure Tour will take you past the tip of Palawan to Culion and the Linapacan Islands where you can swim in some of the clearest water on earth. 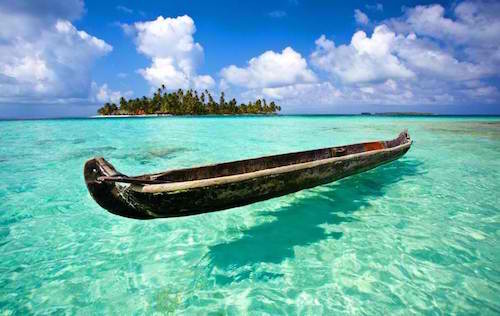 You will get to experience deserted tropical islands and beaches. The reefs are still in good conditions and there are lots of tropical fishes to see. The Ultimate Adventure Tours last from 3 to 5 days. This is a rare opportunity for you to get this type of experience that you will remember for the rest of your life. Click here to see our next planned tours. The Ultimate Adventure Tour will take you to El Nido archipelago, the Linapacan islands, Culion and Coron. Depending on the length of the tours available while you choose, this expedition in the northern islands of Palawan will last from 3 to 5 days. 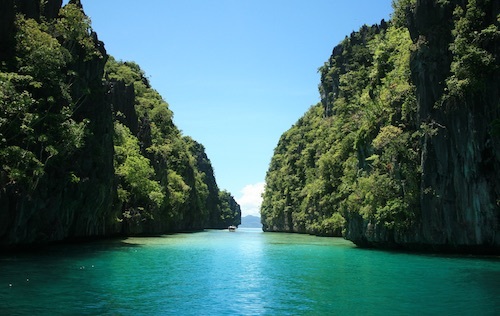 There is a reason why this tour is named the “ultimate”: it brings you all El Nido island hopping has to offer… and more! You will be island hopping, snorkeling, overnight camping, discovering beautiful islands, lagoons and white-sand beaches. And you will do so in places that are practically uninhabited, where your boat will most of the time be the only one in sight. This is the adventure part of this tour. For this reason, you must also be aware that the Ultimate Adventure Tour is not for everyone. It IS an adventure and requires its participants to be in good health conditions. Once at sea, you’ll be far from medical infrastructures. Please do not apply if you’re not certain of your ability to participate. 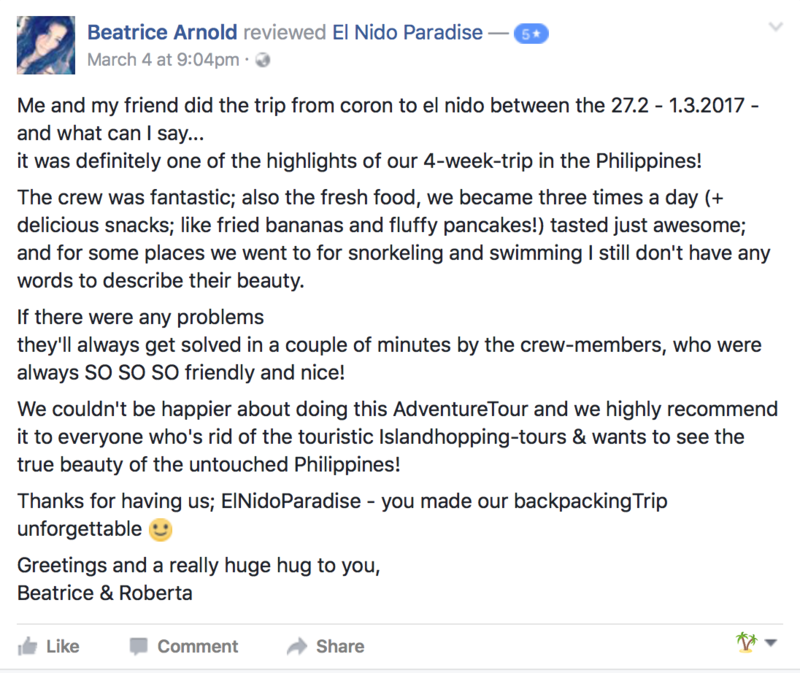 The following itinerary describes the tour from El Nido to Coron. 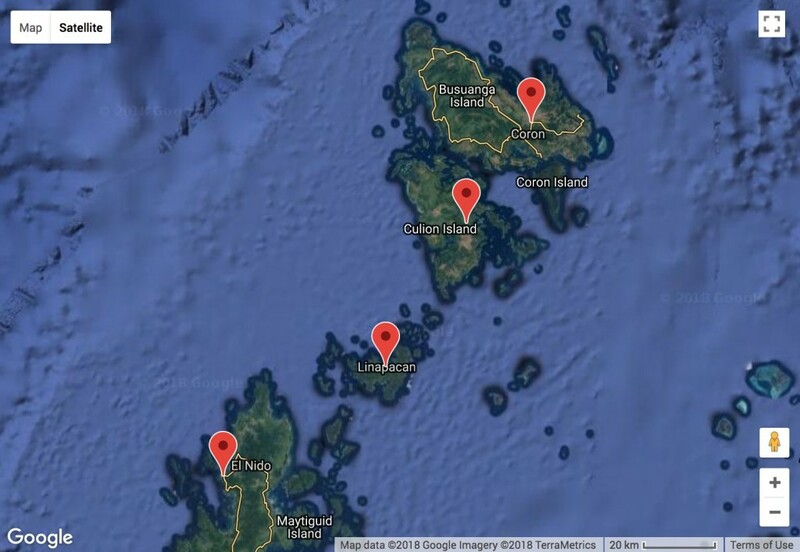 If you’re doing it from Coron to El Nido, the order of the destinations will be in the reverse way. Your Ultimate Adventure Tour will depart from El Nido town in the morning. After a first island hopping and a 30-45 minutes snorkeling time, we will stop on a beach and the crew will grill and cook a delicious lunch buffet for you. We will continue to sail up north in the afternoon, passing by this splendid tropical islands scenery and bringing you to more places before setting camp for the night on a deserted island. There our crew will install the tents and built a big bonefire while you can relax drinking a rhum & coke. The next day, we will bring you to the Linapacan islands, which have some of the cleanest and clearest waters on earth. It’s a great place where to snorkel and relax on some of the most beautiful beaches in Palawan. You will also get to meet the Tagbuana, the local people of Linapacan, and discover their culture and way of life. Depending on the length of your tour (3 to 5 days), you will explore this untouched tropical paradise for 1 to 2 days. On the next morning, we will continue to sail up north, to start exploring the eastern part of Culion island. Among other things, you will discover a new fishers’ village and what is probably the most beautiful sandbar in Palawan. After a night spent on a beach, we will head to Coron for a new island hopping tour, to discover its snorkeling spots filled with thousands of fishes. 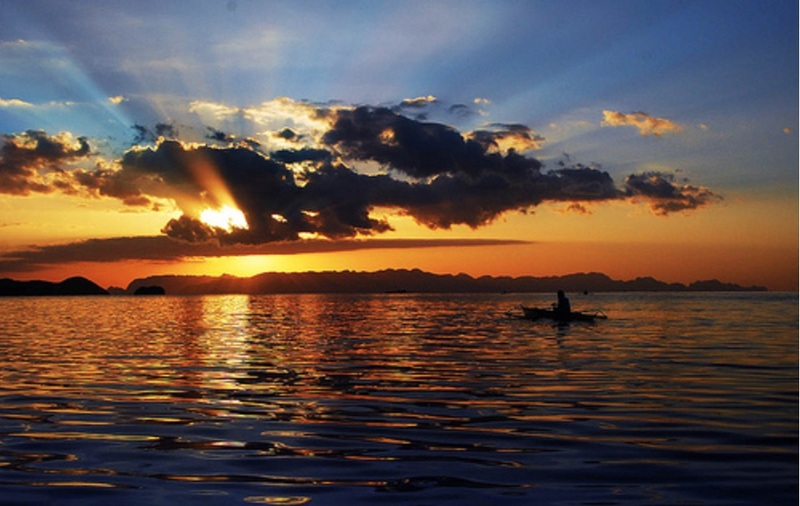 Before dusk, you will land in Coron, the end point of the Ultimate Adventure Tour. 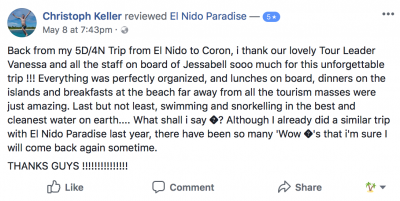 From there you can decide to continue your adventure in Palawan and Philippines, maybe going up to Mindoro, or taking a boat back to El Nido. 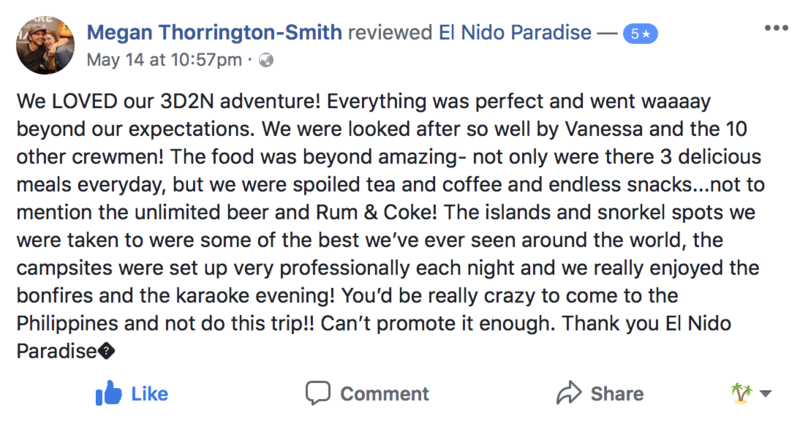 The rest of the adventure is yours to choose! 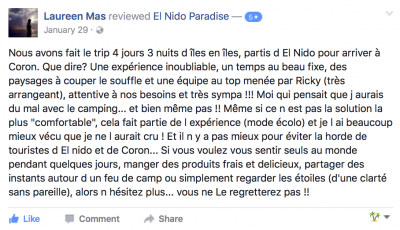 The best to get an idea of what is the Ultimate Adventure Tour is probably to let our valued guests share their experience. 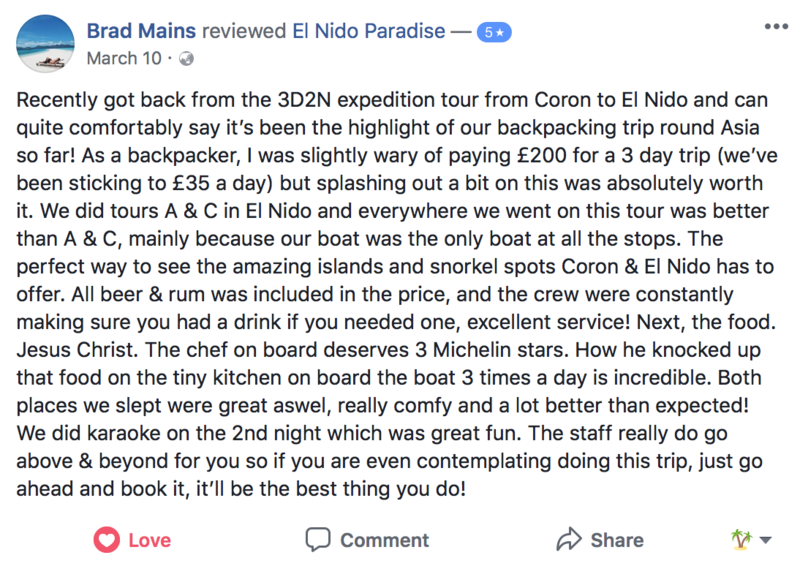 Here are some reviews they left about their expedition with us between El Nido and Coron. 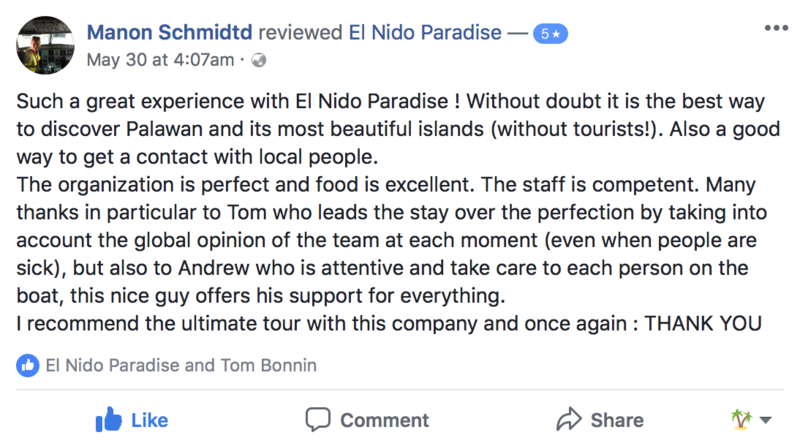 You can simply click on the reviews pictures to see them full size! When Can You Join The Adventure? Below is the list of the next open group tours planned in 2017! We organise the Ultimate Adventure Tour every week during the high season (November to May). Here are the next open group tours planned for this season, by months and by duration (from 3 days and 2 nights to 5 days and 4 nights). Most of the tours are 3D2N but we also organise longer events, especially during special vacations (such as Christmas, New Year’s Eve, Chinese New Year…). 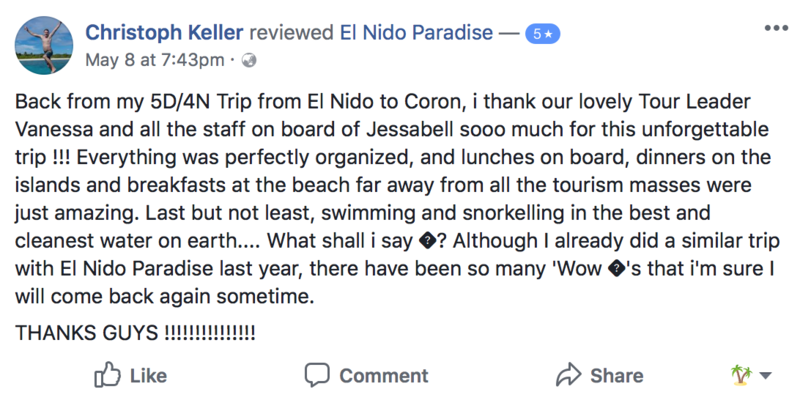 In addition to the detailed schedules below, you can see the available tours by duration directly in their calendars, on the pages available here: Expeditions from El Nido to Coron and Expeditions from Coron to El Nido. If you cannot find dates fitting your trip, shoot us an email and we’ll see if it’s possible to add a tour at these dates (as long as you contact us at least 4 to 5 weeks before the said dates) or to modify one of the scheduled tours (provided there are no active bookings on them yet). You can also book a private tour. To get more info, don’t hesitate to contact us. Are You Looking For A Private Adventure Tour? If you’d prefer to have a private tour, which can be organized at the time and with the number of guests of your choice, it’s possible! Just send us an email thanks to our contact page. 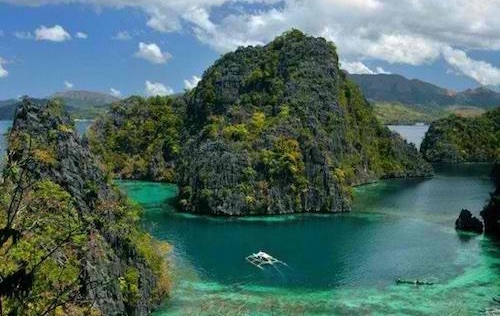 Decide of the length of your trip from El Nido to Coron. Online booking available. Decide of the length of your trip from Coron to El Nido. Online booking available. 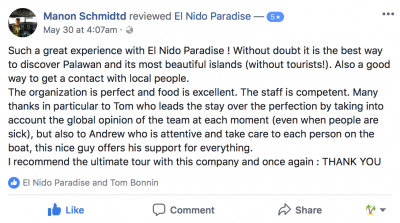 El Nido Paradise is a website dedicated to the town and surrounding areas of El Nido, Palawan. 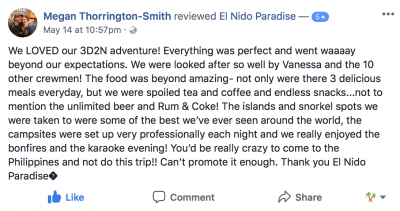 Learn more about the area, book your tours online, and get in touch to ask us for advice on organizing the perfect stay! What is the Best Time of the Year to Come to Palawan? 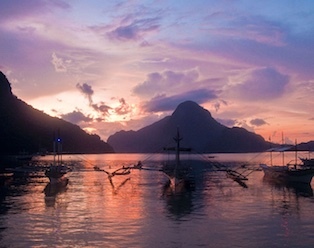 Can You See Whales And Dolphins in El Nido? 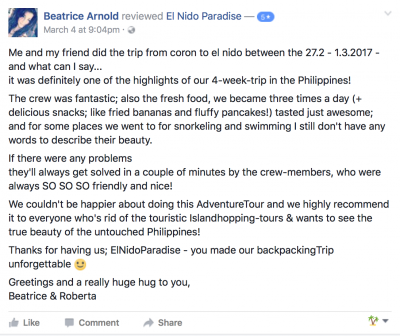 How to Get to El Nido, Palawan?